Back in 2011, I answered a series of questions about Norse mythology and religion from a very intelligent high school student. In 2012, I answered another set of interesting questions from a middle school student. 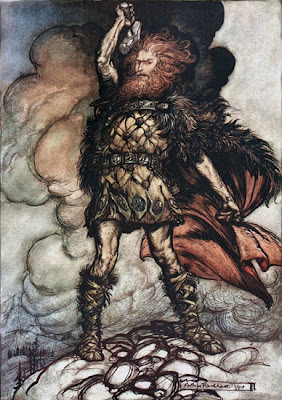 Now, I've been contacted by another very curious middle school student who is researching Norse myth. To a Viking, San Ramon sure would seem like a different world. 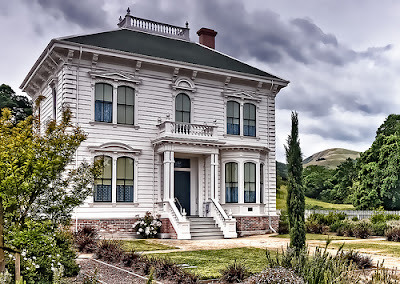 Lori Luo is a sixth grader in Ms. Jennifer Keenan’s class at Windemere Ranch Middle School in San Ramon, California. She is working on an “I-Search” project on Norse mythology and contacted me to help her with her research. I’m glad to help! Her questions and my answers are below. LL – Which god seemed to be the most favored by the ancient Vikings? KS – There are several different answers to this question. If you had a ship that could travel through both time and space and you visited different lands at different points before and during the Viking Age, you would find that different gods were favored in different places at different times. Okay, I’ve used the word different six times (now seven times!) in this paragraph, which is a bit confusing. Let me explain. If you visited Sweden in the 11th century and went to the city of Uppsala, you would find a large temple with a statue of Thor in the center spot. Off to the side, you would see statues of Odin and Frey. For this particular population in this particular area at this particular time, Thor was considered the mightiest of the gods. The people would tell you that Thor “presides over the air, which governs the thunder and lightning, the winds and rains, fair weather and crops.” You can see how this would be important for a community based on farming. 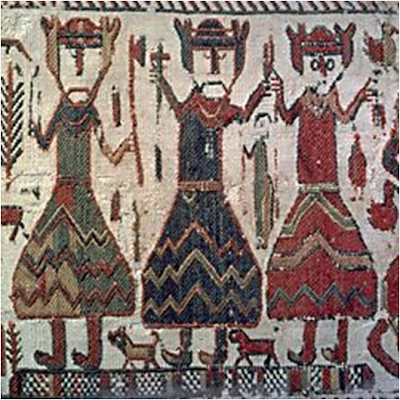 interpreted by scholars to be the Norse gods Odin, Thor & Frey. If you went back a little farther and visited a wealthy warrior in Iceland in the 10th century and he invited you to stay for dinner, you might hear a poet sing songs about Odin. Because Odin inspired both the fighting spirit of the warrior and the creative spirit of the poet, he was considered the most important god in halls of this time and place. 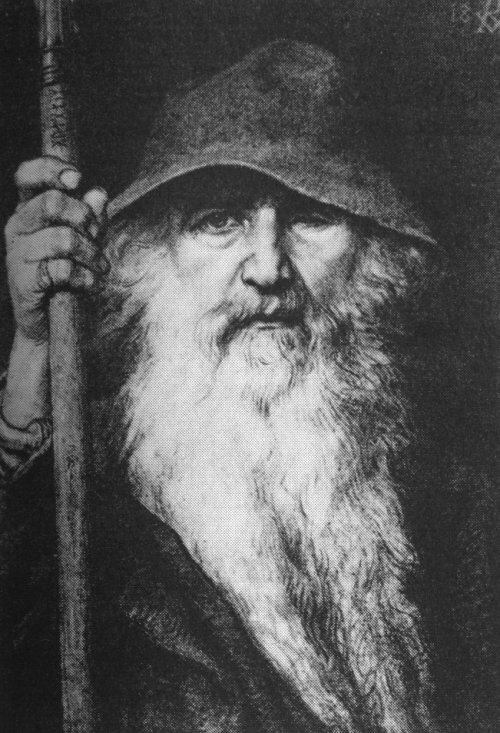 Since the Icelandic courtly poems have survived (because they were later written down), we have a lot of information about Odin. There were many gods and goddesses, and they were worshiped by many different groups of people over a very large area and a very long period of time. Your social status, your geographical area, your family history, and your time period were all factors in which particular god or goddess you might have thought was most important. 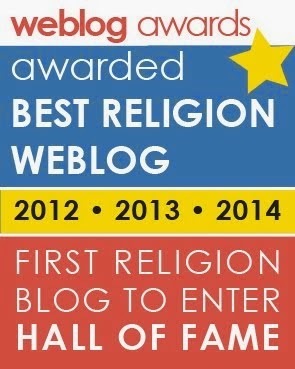 LL – How did the gods treat each other, humans and other beings? KS – The Norse gods are a lot like you and me. Sometimes they are happy and kind. Sometimes they are angry and selfish. We’re not perfect, and neither are they. I think this is one of the reasons why the Norse gods are so interesting. They are not all-powerful, all-knowing spirits that exist outside of time and space. On the contrary, they are fallible physical characters that sometimes make mistakes. They walk through the world and interact with all the groups that live in various areas: giants, dwarves, trolls, elves and people. At least in the version of Norse mythology that was written down in Iceland, the gods are a big family. They live together in Asgard, which is like the city of the gods with many homes and estates. Like any family, they argue with each other and get into disagreements. Also, like any family, they pull together and support each other when someone is hurting or needs help. Thor is probably the god you would be most likely to meet. In one famous story, he basically adopts a young boy and girl named Þjálfi and Röskva. By the way – if you don’t recognize the letter Þ, it’s called a thorn and is pronounced “th.” It’s really an ancient rune that survived into modern Icelandic. Runes were letters used by the ancient people of Northern Europe before they learned our modern Latin alphabet, which arrived in the North with the conversion to Christianity. In the myths, runes sometimes have magical properties. Odin had to go through a scary ritual in order to bring them back from the Other World so they could be used by gods and humans. These two young kids then join Thor on his adventures. They travel with him to far-off Giantland and take part in some of the most famous myths. Thor is like your favorite uncle. He loves kids, he has great stories to tell and he might even sneak you some tasty snacks when your mother isn’t looking. He has a bit of a temper, but he is quick to forgive and always tries to do the right thing. LL – What are all the major gods in the pantheon’s names and doings? KS – All the major gods? All their doings? That’s a pretty big question, Lori! I’ll introduce you to three of my favorites. You’ll have to read some books on Norse mythology to learn about the rest! 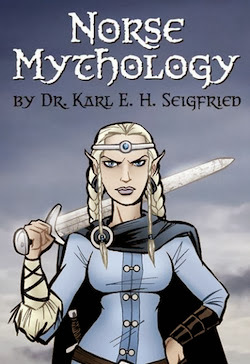 If you don’t already have it, I suggest you pick up Ingri and Edgar Parin d’Aulaire's Book of Norse Myths, which has kid-friendly versions of all the main stories and is a really good introduction to all the gods and goddesses. Each of the Norse gods is a complicated and interesting character. You’ll often see Thor referred to as “the god of thunder,” but that doesn’t really make sense. Why would you need a god of thunder? Thunder is just a loud noise. A god of storms, on the other hand, totally makes sense. Storms bring rain for the farmer and bring wind for the sailor. They cool down the summer heat and blow away the winter snow. Remember what I quoted earlier about Thor being in charge of “thunder and lightning, the winds and rains, fair weather and crops”? From this perspective, you can see why Thor was an important god for both farmers and sailors. The thunder is just his way of announcing himself. Thor’s hammer was a mythic way to understand lightning in a time long before we had a scientific understanding of electricity. People saw a flash of light and saw trees burst apart and houses catch fire. In ancient times, it was completely logical to conclude that Thor had thrown his burning hammer down from the clouds, and what we call lightning was really the path his weapon burned as it flew through the sky. Ancient people believed that Thor used his mystic hammer to protect us from the terrifying giants who wanted to freeze us and wipe us off the planet. Thor is the guardian of both humans and gods, and he is the great enemy of dangerous giants and trolls. Odin is also a very complicated guy. On one hand, he can be seen as the god of language, poetry and runes. On the other hand, he is also the god of magic, war and death. Unlike your big, bearded Uncle Thor, Odin isn’t quite so friendly and trustworthy. He can be downright devious when he sets his mind on something, and he will do whatever it takes to accomplish his goals. This is my favorite picture of Odin. One side of Odin is really deep and beautiful. He is determined to learn all that he can about the world, even if what he learns doesn’t make him any happier. He is willing to sacrifice one of his eyes for just one sip from the Well of Wisdom. He is willing to hang himself from the World Tree for nine days and nights without any food or drink in order to gain knowledge of the runes. He travels all over the world (actually, the Nine Worlds) to ask questions about the origin of the universe, about the way things are now, and about the way the world will end. He risks his life by questioning powerful giants, and he even raises prophetesses from the dead to ask what the future will bring. I think that this determination to learn everything he can – and to make personal sacrifices to gain wisdom – is very inspiring. We should all work hard to learn everything we can about the world. If you want to be a scientist, learn as much as you can about the parts of science that most interest you. If you want to be a musician, dive deep into music and learn all you can about the subject. In this regard, Odin is a great role model. However, the other side of Odin can be pretty frightening. On his travels, he learns all about Ragnarök, which means “doom of the powers.” The powers are the gods, so Ragnarök is a term for the end of the world, when the giants and the evil dead rise up and destroy gods, humans, elves, dwarves and the world itself. Before you get too worried, you should know that the giants themselves are destroyed, and that a new world of peace and light will rise up from the ruins of the old world. The knowledge of this great calamity in the future drives Odin to do some dark things. Odin stirs up war and fighting all over the world. Why would he do such a horrible thing? Because he knows that this great battle with the giants is coming, and he wants to build an army to fight on the side of the gods. By causing war throughout the world, he can discover who the greatest warriors are. He sends out his army of mystic warrior women, the Valkyries, who ride flying horses over the battlefields of humans and pick out the greatest heroes. Their name explains what they do: Valkyrie means “chooser of the slain.” They decide who will die in battle, then they scoop up the dead heroes and take them to Valhalla, Odin’s hall in Asgard. 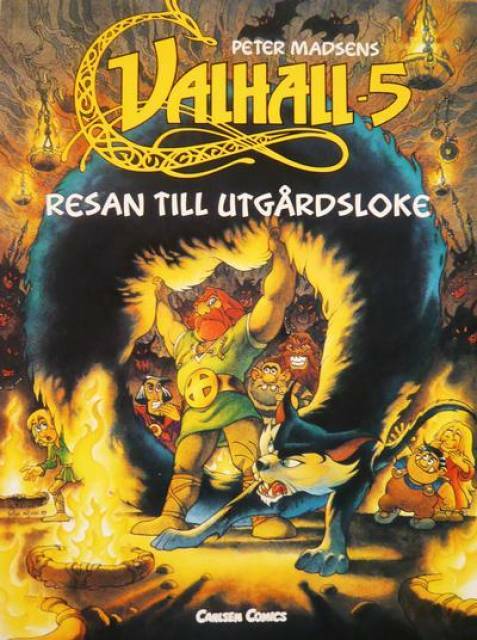 Valhalla means “hall of the slain.” Are you sensing a theme here? In Valhalla, the dead warriors spend all day fighting and killing each other. At dinner time, they all come back to life, hug each other and go into the hall to eat. They feast on a pig who – like them – comes back to life every day. Yes, it’s true. The warriors of Odin have a literally endless supply of bacon. Since they’re already dead, they don’t have to worry about the fat causing heart disease! Why do they keep on fighting and killing each other? Because they’re in training for the final battle. Odin wants them to be ready to fight the giants when Ragnarök finally arrives. Wait! Didn’t I just say that all the gods and humans and everybody else will die at Ragnarök? Yes. Yes, I did. This is one of the interesting things about Norse mythology that really reflects the values of the culture that created it. Even though Odin knows that he will lose the final battle, he does everything he can to work for victory. He doesn’t get depressed, give up and go cry in the corner. He works to do all the good he can and to keep hope alive. So even the dark, warlike side of Odin’s character has a powerful message behind it: no matter what happens in your life, no matter what obstacles are in your way, always have hope. Always fight to be the best you can possibly be. Never give up, but fight to make your dreams become reality – no matter what stands in your way. Freya is my other favorite. If Odin is the Allfather of the gods (and that’s what he is often called in the myths), you can think of Freya as the Allmother. She’s just as powerful and just as complicated as Odin. Like him, she also has a light side and a dark side. 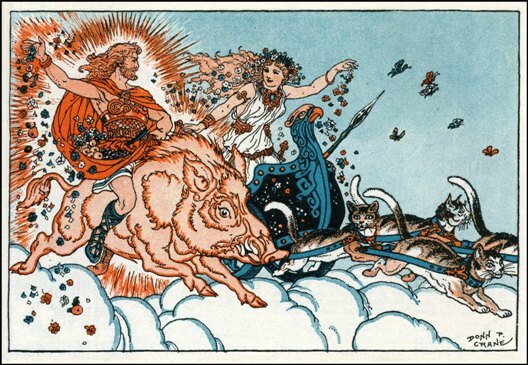 Freya drives her cats while her brother Frey rides his boar. If I had a choice, my chariot would be pulled by magic dachshunds. Freya is considered “the most glorious” of the goddesses. She represents all that is bright and beautiful. You can recognize her by the shining necklace she wears and by her chariot that is drawn by cats. She has a pretty awesome cloak of falcon feathers that gives her the power to fly through the skies like a bird. She enjoys songs about love and she is always ready to help people with love problems. Hopefully, you don’t have any love problems yet, but Freya will be there to help you out when you’re older! Just as the gods reflect human imperfection, so do the goddesses. Maybe the reason Freya cares so much about love is because she herself has a broken heart. Her husband is missing, wandering somewhere out in the world. Freya cries in loneliness, but she is so magical and beautiful that her tears fall to earth as drops of gold. By means of [seiðr] he could know beforehand the predestined fate of men, or their not yet completed lot; and also bring on the death, ill-luck, or bad health of people, and take the strength or wit from one person and give it to another. So, the flipside of Freya’s golden beauty is a little bit witchy. One ancient poem says that she Made magic wherever she could, with magic she played with minds, She was always the favorite of wicked women. Fólkvang means “field of the people.” What does that mean? Think of it is a riddle. What is the field where you bury people? The answer is a graveyard. That’s a pretty grim name for a hall owned by such a beautiful goddess! It definitely shows that there is more to Freya than a pretty face. To make this all even more mysterious, we never find out in the Norse myths what Freya does with all her warriors. Is she preparing for Ragnarök? Does she just need help babysitting her kittens? What a lovely explanation for her, Karl Erik. I sometimes speak at my children's school and our conversations double when I mention the Norse gods. They are fascinated by them. I think one of their favorites is Tyr and Fenrir. I am looking forward to part two! I really enjoyed reading about the gods in such a direct and accessible style, and am looking forward to part two. Really well done! I am sure you have left this girl with a desire to learn more :) Great respect for those who choose to teach instead of preach. My favorite is Odin also,wisdom does appeal to me ,I always thought that freya takes receives the souls of non-warriors ...if not ,where else would they go?